the third commentary looks at the Fed’s policies and organizational changes. Finally, our fourth commentary offers our investment summary and conclusions. 2.5%. If tax reform passes, there will be upside risk to those forecasts for reasons we cite further in our commentaries. A recent International Monetary Fund study showed the strong influence of the U.S. dollar on world trade. That study concluded the strength of the U.S. dollar—it labels the dominant currency--provides a key predictor to aggregate world trade volume. That study showed a stronger dollar leads to a decline in world trade. We suspect the opposite case will also prove true as the dollar weakens. In their study, procyclical categories comprise 42% of personal consumption expenditures (P.C.E.) compared to 58% for acyclical categories. For reference, acyclical categories include health-care and financial services as well as clothing, transportation, andother small categories. The following graph shows the P.C.E.inflation for both categories. Health-care services contributed the major drag to low acyclical inflation. Without the drag from health-care services, the study suggests core P.C.E. inflation would range slightly above 2% for the post-recession period. Reduced growth in Medicare paymentscontributed to this slower inflation. Possibly this may show a small uptick. The study indicates that inpatient Medicare payments will increase from 0.6% in FY2017 (ends Sept. 30) to 2% in FY2018. reform, capital spending seems to be accelerating. So far this year, capital spending increased over 7%. This represents the fastest growth rate in three years. Further evidence, in October, nondefense capital goods spending showed its ninth monthly increase in a row—the first time since 2004. 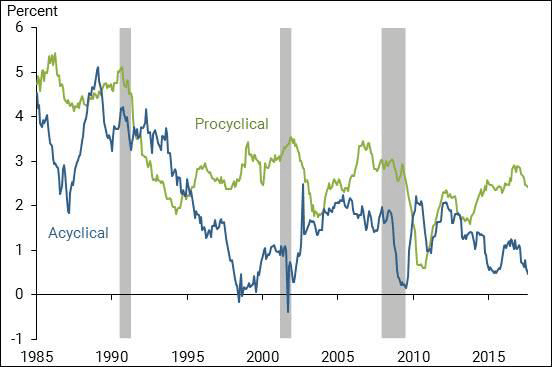 No doubt, increasing capital-spending improvement comes as the business cycle moves through its maturing phase. Nonetheless, tax reform’s provisions for stimulating capital spending should extend the current capital spending cycle for some time.